In the light of the controversy about advertising claims that God can heal today, it was interesting to see that even the generally secularist BBC has published an article suggesting that prayer for physical healing may well be effective. The BBC Home Editor, Mark Easton, has written an article Prayers for Muamba. This is about the Premier League footballer (i.e. 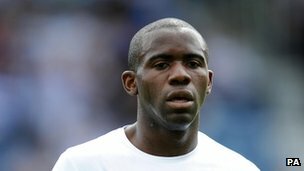 soccer player) Fabrice Muamba, who was taken ill during a match on Saturday, and remains in a critical condition. Have you prayed for Fabrice Muamba today? His family are exhorting the country to believe in the power of prayer, and I suspect many millions of Britons, whether they have faith or not, will have felt moved to offer a silent appeal to an invisible power asking that the young footballer pull through. The study looked at 17 previously published papers and found that “patients who received intercessory prayer demonstrated significant improvement” in seven of those. However, there were questions about the validity of some of the research and the evidence was not sufficient for “prayer” to meet the criteria required for an “empirically supported treatment” in the United States. Whatever you might think about its links to a supernatural being, intercessory prayer is a straightforward way for an individual to focus the mind on their capacity to think nice thoughts. Anyone can close their eyes and make a wish that bad things do not happen. Right now, Britain is praying that Fabrice Muamba makes a speedy and full recovery. Not exactly how a Spirit-filled Christian would put it, but nevertheless it is quite something for the BBC to publish even this. Indeed I can’t help wondering if someone will complain about it to the Advertising Standards Authority. But it seems clear where public opinion lies on this one. Let us pray together that God touches Fabrice Muamba and restores him quickly to full health and strength. Amen. This entry was posted in Healing by Peter Kirk. Bookmark the permalink. AMEN, and indeed again Amen. Lord let it be yet another astounding proof, as hoteliers in Hull declared, “Now we know God is real”. Not two weeks ago, they’d carried a wheelchair-bound lady upstairs because their lift was broken. Upon being asked why she’d come there and she told them; for my healing at a Christian event (oh yeah). The next day she returned walking into the hotel lobby and pushing the wheelchair ahead of her! Thanks, Richard. I love the story! Yes, I read the article too and it made me smile. Fabrice Muamba’s fiancee is clearly a Christian and it is her faithful witness that has stirred this up. The reaction shows to me that there are many people who want to believe in the power of prayer even if they’re not sure who they are praying to. Maybe some of it is superstition, but any discussion of God healing in the media is a welcome thing. It gives me hope for our society. Maybe many people are not actually that far away from God, they just don’t know what to do about it. I’m sorry to rain on this little parade, but are you people seriously suggesting that Mr. Muamba is so special that god first gave him a heart-attack, big enough to be fatal, and changed his mind after people started praying? And if that were true, why not heal him straight away, in stead of using modern science? It feels like cherry-picking to me. People have to make up their mind: if all is in god’s hand, don’t rely on doctors, not even under the most dire of circumstances. Just pray and leave the hospitals to us heathens; we believe in the miracles of science! No, Henry, I am not suggesting that. Nor I think is anyone writing about this story suggesting that. Specifically, I am not saying that God gave Muamba a heart attack. I don’t know why this happened, but I am confident that it was not caused directly by God. Of course that still leaves open the issue of why God didn’t prevent it before it happened rather than reversing its effects afterwards, but I don’t think we should be telling God what to do. You can trust in medical science if you like. But I hope you don’t suffer a heart attack like Muamba’s, as the doctors know very well the most likely outcome. But Peter, I don’t know what happened either, but I think it’s some construction-fault. We had a marathon here a week or so ago, and a seemingly fit 14 you boy suffered a stroke and died. He had a medical history, so does that mean some higher being, god or devil, was toying with him for a while? Even as a child, with soft-core RC parents, I couldn’t understand religion because of all the inconsistencies. But in some cases, people are cured, usually by modern medicine, and it’s god’s work. If they die, god happens to work in mysterious ways: he was distracted, didn’t care at the time, whatever. It sounds more like a giant slot-machine to me but with prayers, and not coins: sometimes you win, but most of the time you lose. If do suffer a heart-attack, I hope for the best medical care and people can keep their fingers crossed or pray. But if I happen to survive and be my old self again, it will be because of medicine. If I die, I happened to be irreparable, like a machine you can’t get spare parts for. Sorry for playing the devil’s advocate. Henry, you are not a very good advocate for the devil (or perhaps you are) because you are leaving him out of the picture. You are also leaving out the human factor. The state of a human heart (the physical organ) is not just what God made it. It can certainly be affected by human folly – do we know what Muamba’s mother, or the 14-year-old’s, ingested during pregnancy? It can also, I would suggest, be affected by the activity of Satan and his demons, indirectly if not directly. Yet somehow you seem to assume that all Christians make God the cause of every sickness, when in fact I don’t think any Christians would go that far. Hang on a minute Peter. You are now blaming the devil or some transgression of Muamba’s mother while pregnant for him having a sudden heart attack? This is no longer a slot machine and is simply a game of cards where the dealer gets to stack the deck however he likes. You have to remember that your god is omniscience and omnipotent. Any action he takes or fails to take is his responsibility. If somebody god created gets sick with an illness god created or allowed, it is god’s fault. If the devil did it, who created the devil? It’s still god’s fault. If Christians do not go so far as to make god the ultimate cause of every sickness, why do they go so far as to make him the cause of curing that sickness? You want it both ways – god never does anything bad or allows bad things to occur, but good things that occur he must have had a hand in. Your god is either incompetent, uncaring or non-existent. You can’t blame the devil for that. My final comment: if good stuff happens, we owe it to god, and that’s quite clear. But bad stuff happens too, and as god is all powerful and omniscient, he must be behind that as well. And if Satan behind all this, why doesn’t god stop him, as he’s supposed to be stronger one. If he isn’t, it would be wiser to start worshipping the devil. Unless, of course, god and devil are playing some cosmic game with the universe, in which case we can abandon all hope as far as they’re concerned and start living our lives without them, because it wouldn’t make any difference in their eyes. Saint or sinner: if your number is up, the game is over. I’m glad I don’t have to bend over back-wards to reconcile a loving god with all the bad stuff he could, but won’t or can’t, prevent. John and Henry, please do not entirely misrepresent my theology and blaspheme my God by assuming that I believe him to be the author of all evil. For that matter nor do I hold him to be the author of all good. He has given free will to humans (is that a bad thing?) and perhaps to evil powers. That free will is exercised sometimes for evil, sometimes for good. I accept that that is not a complete answer to the issues you raise, but it is a start. Peter, my site was linked to today on The Freethinker as well as yours. I’ve been trying to engage in some sensible open debate with the other commenters there, but I just get shouted at. I get the impression that their minds are closed to any other way of thinking, which makes me wonder whether the title of the site is deliberately ironic. There is a lot of anger there and it’s not healthy. Thank you, Gillan. Yes, there’s a lot of anger there. And I think it is often because people have been hurt by the kind of teaching like John Piper’s that I referred to a few days ago, which blames God for tornadoes and the Titanic disaster. Sadly far too many people have rejected God because they have been told that that is what he is like. It is not an answer at all, and it is not even a start, it is simply a dodge. As I said, your god is supposedly omnipotent. That makes any evil that happens his responsibility, because he chose not to act to thwart it. Free will may well be a bad thing when it leads to endlessly bad results (and presumably an omnipotent, entirely good being could easily create good people with free will), but aside from that argument, free will has nothing to do with whether or not someone is born with a genetic mutation that causes a structural defect in their heart. That is, by your own reckoning, god’s work. Again, your god is either evil, incompetent or does not exist. There is a lot of anger at the Freethinker and I am sorry that at least some of them won’t engage in a civil discussion. I can understand their frustration, though – they have seen so many of the self-righteous using their god as a crutch and a bludgeon, and ultimately if the world were to follow your faith then people like Muamba would be dead because prayer simply does not fix heart attacks. That is, if he was not a slave because the bible says slavery is perfectly acceptable. They have no respect for you because you blatantly have no respect for anybody else – even to the point of casting aspersions about the mother of a man you have never met, going to any length to explain why your god is not at fault for somebody dropping dead but deserves credit for his resuscitation by men and women. John, it is simply untrue that a person is responsible for every evil that they could possibly have prevented. If your wife or adult son goes out and commits a crime, are you responsible because you failed to lock them up inside your house when you had the power to do so? No, you didn’t have the right to lock them up but had the duty to allow them the freedom to do what they wanted, so you are not responsible when they do something wrong. More or less the same argument applies to God. I never said that congenital heart abnormalities are “god’s work”, a sentiment which I would reject. If everyone were to follow your faith in medical science, then Muamba would be dead, because medical science simply does not fix heart attacks like his, and men and women cannot resuscitate people who have been dead for over an hour. His racial origin is irrelevant, and it is offensive of you to allude to it. John, I don’t think there are many Christians who think that we should abandon medicine and just rely on prayer. I think you need to think carefully about how you choose to put down Christianity. I don’t follow Islam and there are a lot of things about it I don’t agree with, but I wouldn’t feel comfortable arguing with Muslims about their faith unless I’d really done my homework. I think a lot of Christians get annoyed with atheists because they take pot shots without really making the effort to understand what the other side believes. There is plenty that the church has done in the past that it should be ashamed of and plenty that some Christians do now that doesn’t reflect biblical teaching. Don’t get our human failings confused with God’s character. God is not the church. Gillan, thank you for that helpful comment, which I agree with. I would also add that I would by no means blame Muamba’s mother, even if hypothetically his heart problem could be linked with her pregnancy or his infancy. No doubt she did the best she could to bring up her son in war-torn Zaire. Once more, Peter, you are ignoring the large elephant in the room – by your reckoning, god is omnipotent. If a doctor has the power to save someone’s life and chooses not to because they disapprove of that person’s lifestyle or moral choices, or they capriciously do not feel like it, they are responsible for that death. God, presumably, has the power to give and take life, and does so arbitrarily, making each instance of death his fault through action or inaction. And yes, medics can resuscitate people who have had a heart attack, and please note that the medics did not sit on their hands and pray for an hour and then try to revive Muamba – they kept his heart and lungs working artificially for that hour, that is why he survived. Prayer was irrelevant, and it is offensive of you to dismiss the skill and dedication shown by the medical team. Of course, you don’t care at all. You did not say that the heart defect was god’s work, but you did say that the heart defect may have been caused by a moral failing of Muamba (or his mother, again demonstrating your lack of respect for anybody but your deity and his minions), or of an agent given free will by your god (well whose fault was that?). In every case, it is ultimately the responsibility of that god – he allowed the defect to manifest itself, one way or another. Also, did god not make everyone and everything in the first place? How is it offensive of me to refer to the man’s racial origin? It is there in black and white (so to speak) in the bible that slavery is ok. It took a secular mindset to disregard biblical teaching for the UK to finally abolish slavery, and it took bloodshed for the same to occur in the US. The point is quite simple – you are cherry-picking that which suits the god you have created in your own image. Your god is blatantly racist and violent, encouraging and condoning horrific and inhumane acts, but you are not, so you filter what the bible actually says and shape this being into something entirely different. Then you clutch at your pearls and get all upset at people ‘blaspheming’ the god you contort yourself into worshiping despite his character being one that you cannot actually stomach. If a doctor has the power to save someone’s life and chooses not to …, they are responsible for that death. No, John, that is not always true. It is not true if the patient does not give consent to the required procedure. It is not true if that doctor is not the patient’s appointed doctor, and the appointed doctor rejects the proposed life-saving treatment. If the first doctor intervened under those circumstances, they would be guilty of misconduct. Similarly God normally only heals where he has been given permission to do so, and where the patient is not allowing only Satan or the world to treat their sickness. No, I did not say anything about “a moral failing of Muamba (or his mother …)”. My point was that they might have accidentally done something, or been forced into it by the situation in Zaire, which harmed Muamba’s heart. Nothing at all about moral failings. In a similar situation, when Jesus was asked about a man born blind, “who sinned, this man or his parents, that he was born blind” (John 9:2), Jesus refused to blame anyone – and healed the man. Meanwhile I suggest you look at the history of the abolition of the slave trade. Did Wilberforce, a committed Christian, really have “a secular mindset”? No, he saw the clear implications of biblical teaching, that slavery was wrong, and acted on those implications. John, I’m sorry if this comes across as rude, but why are you so angry about something you don’t believe in? Has Christianity offended you so badly that you feel the need to spend so much time attacking it. Rationally is this the most effective way to share your point of view? John, if it makes you feel any better, yes, God is “responsible” for everything he either causes or allows to happen, or, as you put it, through “action” or “inaction”. And for most of us, we don’t get to choose when we die or how we die. That’s his prerogative, unless we decide to fast track it. If I am to die today or tomorrow, then what have I got to lose? I’ve got no grudges about leaving a pathetic world that is not getting any better. Perhaps you’ve got your own personal biases for wanting to be around longer. Well, I don’t. But whichever way I go, I hope by God’s mercy it will be as quick and painless as possible. And if not, then that’s his prerogative too. But I still take comfort in the fact that the sufferings of this world are only temporary and short-lived compared with eternity. The only thing that concerns me now is the judgment that I believe is to come, where each of us will give an account of every decision made and every idle word spoken. If I believe that Jesus died and suffered for me, why should I think that I should be exempt from such myself? So die I may, but in the meantime, to my Lord I shall live and follow. Robert, thank you for the reminder that for us Christians, although not for unbelievers like John, physical death is not the ultimate disaster, but a step towards the next phase in our everlasting life.